Highland County Commissioners Gary Abernathy, Jeff Duncan and Terry Britton are shown in regular session Wednesday voicing their unanimous opposition to State Issue One. Highland County Commissioners Gary Abernathy, Jeff Duncan and Terry Britton unanimously came out against passage of State Issue One at their regular Wednesday meeting. Duncan further stated that if the bill passes, it will be an additional burden on counties that would in turn have to find ways to fund it. The release states that according to the Ohio Department of Health, in 2016 alone, nearly 60 percent of overdose deaths involved fentanyl, a dramatic rise from the 4 per cent found in 2013. The reason given for the huge increase is that fentanyl is 50 times more potent that heroin. According to the U.S. Drug Enforcement Administration, the amount of powdered fentanyl needed to kill the average person would barely cover Lincoln’s beard on a penny. Duncan’s math lines up with Drug Enforcement Administration figures that state a lethal dose of the drug is just two milligrams, which is two one-thousandths of a gram. She also indicated that special interest groups from outside Ohio have spent more than $4 million to place the issue on the November ballot. “We can expect to see Judge Coss’ and Judge McKenna’s report in the next few weeks, at least before the election,” Britton added. In other matters before the commissioners, the annual assessments on sewer rates will remain unchanged for the Rolling Acres Subdivision on Mad River Road and Lakeside near Paint Creek. All three commissioners attended the farm tour last Saturday, sponsored by the Ohio Farm Bureau and the Highland County Soil and Water Conservation District. Britton said the annual farm event, now in it’s fifth year, highlights agriculture, which is Highland County’s largest industry. On Tuesday, Duncan and Britton attended the Farm Science Review held in London under the auspices of the Ohio State University. 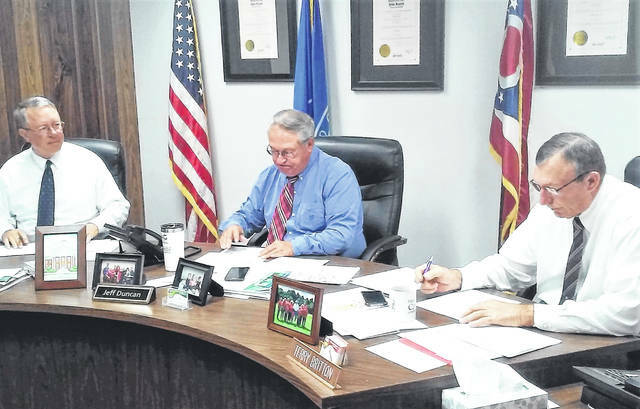 One contract that was on commissioner’s desks and requiring signatures was for the Highland County Sheriff Office’s annual Justice Assistance Grant, which totals nearly $7,000. The contract gives commissioners the authority to sign grant-required papers in the program. According to the JAG website, the program is the leading source of federal justice funding to state and local jurisdictions like the sheriff’s office. It provides critical funding necessary to support a wide range of programs including law enforcement, crime prevention and education, drug treatment and enforcement, technology improvement, crime victim and witness initiatives and related law enforcement programs. There were four resolutions before commissioners Wednesday, with three being line item requests for transfer of funds for county agencies, and one authorizing Highland County Emergency Management Agency Director David Bushelman to be named grant agent of the county mitigation grant through the Federal Emergency Management Agency. Speaking as both a spectator and a team participant, Duncan urged everyone to make plans to attend this year’s Smokin’ in the Hills event at Rocky Fork Lake. https://www.timesgazette.com/wp-content/uploads/sites/33/2018/09/web1_Commish-19-Sept.jpgHighland County Commissioners Gary Abernathy, Jeff Duncan and Terry Britton are shown in regular session Wednesday voicing their unanimous opposition to State Issue One.